Romhacking.net - Review - Very big…! The archive on this site contains both patches released by Drewseph, be sure to read the included Readme before attempting to apply a patch. This hack does not work with ZSNES 1.4x, all future versions of ZSNES will work. 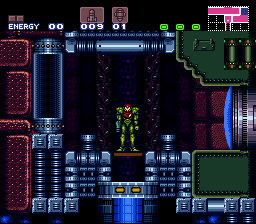 Super Metroid: Redesign features some impressive editing skills by using the existing graphics to make more interesting environments, however the biggest weakness is the shear size of these environments. 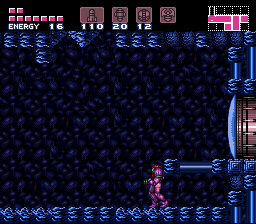 I found it tedious to spend the first 20 minutes navigating the same area just to locate the Morph Ball. Enemies now take several hits to kill, which does make it more difficult, but the large number of these enemies makes moving from area to area too frustrating. 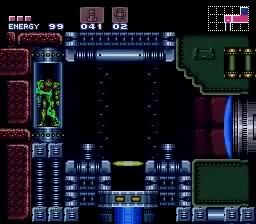 Once I reached the plant mini boss, the battle area was so small that when the creature opened up, I got pinned to the wall and perished rather quickly. 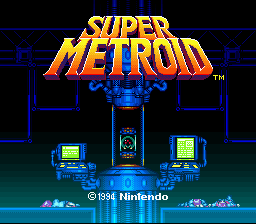 I would suggest giving this a try to see the skillful editing, but as a game, it’s as unforgiving as the original NES Metroid was.